This is the route leading south of Lea Bridge Road (A104) into South Mill Fields in Hackney. It's a convenient and quiet short cut if you are heading towards Hackney Central and London Fields. It's also signed as a cycle route with those lovely blue signs, so I assume it forms part of the legendary London Cycle Network. And gosh, it is cycling-friendly is it not? The drainage is outstanding. (Below) York has a number of road closures which allow cycling access, like this cycling-friendly link between Bedern and Goodramgate. It's a shame about the HGV parked on the footway but I expect the driver wanted to help cyclists by preventing them rushing out into the path of oncoming vehicles. (Below) Permeability in cycling-friendly Waltham Forest. The road closure between Wellesley Road E17 and Lansdowne Road. Waltham Forest has the finest planners in London, with a shrewd grasp of how to make imaginative use of urban space. The stench arising from this case is overpowering. And the news was cynically released just the day before the royal wedding, in order to bury it. An off-duty police officer who ran down a pedestrian and then fled the scene was charged five days later but the case has now been dropped by the Crown. A spokesman for Lothian and Borders Police confirmed that the officer, whose identity has never been revealed, had been cleared and continued to serve with the force. Mr Douglas had been celebrating Hogmanay with his wife and other relatives and was struck as he left CC Blooms nightclub at around 4.20am. The father-of-three had been crossing Union Place, near the top of Leith Walk, when he was hit. Fellow revellers waved down a passing ambulance and he was taken to the Edinburgh Royal Infirmary, but he died of head and pelvic injuries. Following the accident Mr Douglas's grieving father Lewis, 66, demanded answers to why an off-duty police officer would have driven off after the accident. He was reported to have said at the time: "Martin was thrown on to the car's bonnet and then its roof. He suffered terrible internal injuries. This policeman must have known he had hit someone. We need to know why he drove away." After it emerged no case would be heard against the officer Mr Douglas' uncle Kenneth Douglas said he felt it sent out the wrong message, as the officer appeared to be "above the law" and said he was still waiting to find out if the officer had been breathalysed at the scene. 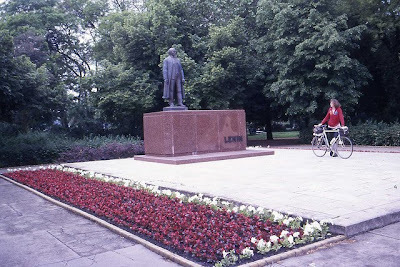 (Above) Statue of a well-known republican cyclist. Photo credit: Sludgegulper. (Below) Car criminal not investigated or prosecuted by Berkshire police. Truly Kate Middleton is an icon of our age, as she is seen speeding down a country lane in Berkshire in her Audi A3 hatchback with her phone clamped to her ear. Cyclists have many thrilling alternatives to the royal wedding. Firstly, a long weekend break in England’s safest cycling city, York. Why not enjoy cycling at its very best? Stuck at home? Do your friends laugh at you for your unsightly handlebar tape? Instead of watching the royal wedding, why not instead thrill to a top cycling expert as he talks you through the correct way to apply that troublesome tape. But seriously, instead of watching all those disturbed people waving paper union jacks made in China, switch off the telly and tune into 51 minutes and 42 seconds of sensible cycling advocacy. After that you could always study some history. Or in the final resort, why not simply get together with some friends and take your clothes off? A CYCLIST has died after a collision with a lorry in Queen Caroline Street. Police and ambulance crews were called to the Hammersmith street at 8.24am on Thursday morning to find the biker, believed to be a woman in her 20s, dead at the scene. Half an hour earlier a cyclist was killed by a lorry in Edinburgh. A 23-year-old man has been arrested after allegedly driving a stolen car into a church wall while drunk. The driver is accused of smashing the 2010 BMW 2 Series into brickwork outside St Patrick's Church in Blackhorse Road, Walthamstow, on Sunday (April 17) at 2.40am. It’s official CTC-backed ‘Cycle-Friendly Infrastructure’! which can be accomplished by painting some markings on the footway. This is a relatively cheap option and ensures that the car-centric status quo can be maintained by providing crap cycling infrastructure at the expense of pedestrians. Under no circumstances must the kind of infrastructure with a proven record of success be mentioned by anyone at the CTC, except when explaining why this wouldn’t work in Britain. If faced with dissent from pesky bloggers, remember to refer respectfully to The Thoughts of Chairman Franklin. (Below) The heart of Islington (outside The Angel tube station), where as you can see it would be totally impossible to re-arrange this narrow six-lane street in order to accommodate cyclists. While traditional British cycle campaigning continues to insist that the proper place for cyclists is among motor traffic, the streets continue to be developed in ways hostile to safe, convenient cycling. Here’s the latest local example: a new pinch point on Northcote Road E17, a two-way cycling-hostile street with rubber speed cushions all the way down the middle. Naturally this cycling-unfriendly street forms part of the crap, meaningless 'London Cycle Network'. Northcote Road is entirely devoted to car parking bays, even though many of the houses along it have off-street parking. Even within the failed culture of vehicular cycling it would have been possible to design better pinch points, providing a cycle by-pass. Waltham Forest is a failed cycling borough, determined to build on its failure. Waltham Forest Council's Cabinet Member for Environment, Cllr Clyde Loakes, said: "The Corporation of London owns the land on which the Log Cabin sits. "The Council has repeatedly asked the Corporation to release land, so the proposed new cycle path and footway can be diverted around the cabin to protect the livelihood of the Cabin owner and allow his business to remain open. "Unfortunately, the Corporation have categorically refused to allow this to happen during more than six months of negotiation. "The Council has now reluctantly been forced to consider de-designating the land the cabin stands on to allow the cycle path and footway to be built. "We really hope the Corporation will reconsider." He added that Whipps Cross Road is a congested route and needs 'significant' improvements to allow it to cope with the thousands of extra pedestrians, cyclists and drivers who are expected to use it during the Olympics. It’s interesting to learn that an unaccountable body like the Corporation of London is totally opposed to cycle paths on its land. A genuine ‘cycling prime minister’ would soon legislate to put a stop to crap like that. Obviously Cameron won’t, because only a delusional fantasist like a CEO of the London Cycling Campaign would ever have believed him to be a cycling-friendly politician. As for the notion that thousands of pedestrians and cyclists will be pouring down a crap 'shared use' path along Whipps Cross Road to the Olympics – this is a further indication that Cllr Clyde Loakes inhabits a fantasy world entirely detached from everyday reality. Answer: nothing. This scene perfectly expresses the values of the Transport for London traffic philosophy. Polluted air, childhood obesity and the suppression of cycling are a small price to pay for making car travel in town centres and for short journeys as easy and convenient as possible. The helmets and vests will be handed out by AA president Edmund King and a crew of AA staffers. King is a keen cyclist, riding in cities on his Brompton and at home on his Whyte mountain bike. Edmund King, director of the AA Charitable Trust as well as being AA president, said: "Cycling has always been a part of the AA’s history. The first AA patrols rode bicycles from 1905 – some 40 years before patrol vans – and they were a regular sight on the nation's roads until the outbreak of the Second World War. And before you get too carried away with that idyllic vision of friendly AA cyclists, do read Robert Davis’s comprehensive demolition job here. EMERGENCY teams this morning (Thursday) were back at the road where a cyclist was killed two weeks ago, this time rescuing people from a car caught in a collision. 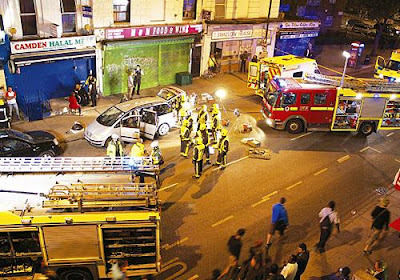 Our front page picture shows how firefighters, police and paramedics rushed to the scene in Camden Road, Camden Town. The street was lit up by floodlights to help rescue squads. 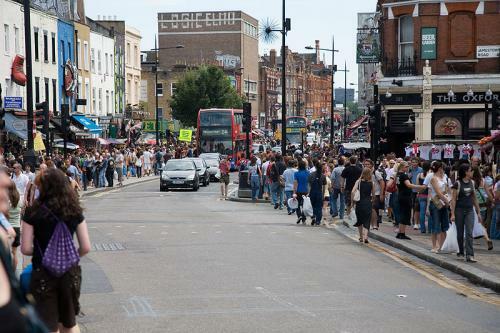 A police spokesman said: “There does not look like there are any serious injuries at this stage.” Campaigners have called for more safety measures to be introduced on Camden Road, nicknamed locally “Death Mile” because of the number of times it is closed. 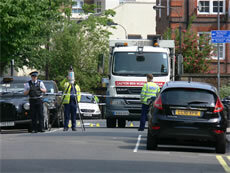 Cantelowes councillor Phil Jones said: “I’m very concerned to hear of another car crash in Camden Road. TfL needs to implement its plans to increase safety without more delay.” Cyclist Paula Jurek died when she was crushed under a lorry on April 6, just yards from last night’s collision. Residents said there was also a crash in the road three days after she was killed. Meanwhile a mother whose daughter was crushed to death by a lorry in central London 18 years ago says she is appalled “how little has been done” since then. Mr Sherwani was lucky not to be hit by the engine of his Lexus IS200, which ended up just inches away from him on the front passenger seat. But he said the car was so well built it protected him from other potential injuries, and he credits the brand as being one of the safest available. And that’s the problem. Many modern cars are built with engines as powerful as were once used in racing cars, but they also offer massive protection to those inside them, encouraging dangerous risk-taking that threatens others with little fear of adverse consequences for the driver. The motor lobby cynically builds cars to travel at twice the maximum national speed limit but has always successfully resisted having to install a simple data recorder which would establish vehicle speed at the time of as collision. Mr Sherwani thinks he was driving at about 55 mph when he crashed. Presumably PC Plod hasn’t been smart enough to notice that the speed limit on this section of the North Circular is 50 mph. In any case, a driver whose excuse is that he fainted at the wheel should surely never again be allowed to drive. This is not anti-social behaviour. This is not theft of the footway for purposes of car parking. The corrupt car-centric police have no interest at all in dealing with obstruction like this. The sleazy local council won’t lift a finger to deal with the matter. Criminal car drivers enjoy protection at the highest level. This is a scene from Anytown. adding that there was no suggestion he was speeding. Isn’t that dangerous driving? Not by the sleazy car-centric standards of the British criminal injustice system. 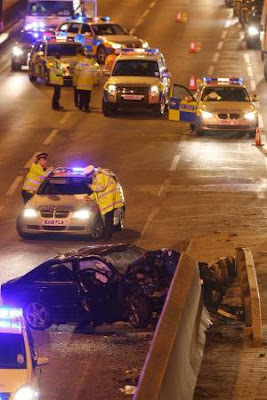 It’s only ‘careless driving’. Monitors on the traffic-choked Marylebone Road were showing readings breaching European Union limits on ozone and pollutant particles linked to respiratory and other health problems. Professor Warren Lenney, of the British Lung Foundation, said air pollution posed a big risk to young children because it can damage their lungs, restricting their airways and making them more prone to asthma. The professor said: ‘We should be breathing normal healthy air with no soot, ozone or toxic nitrogen dioxide because all those things come into your airways and they produce inflammation. 'This then scars the lung tissue which results in smaller airways and can cause asthma, chronic obstructive pulmonary disease and lung cancer. ‘The smog that we are seeing this weekend is as bad as in Dickens’s time in Victorian England. ‘Then, it would have been really bad in November due to all the industrial smoke, but today it is somewhat worse due to the car exhaust fumes. Pollution in towns and cities including London, Oxford, Sheffield, Liverpool and Leeds was as much as double safe levels, according to official data. The pollution poses a particular risk to asthmatics, the elderly and heart patients, who are being advised to be vigilant to any change in their conditions and to seek medical help if they experience difficulties. Research has found that particulate matter causes between 12,000 and 24,000 premature deaths a year in Britain. In 2007 scientists at the University of Southern California found that children who lived within 500 yards of a main road had stunted lung development. Yesterday 39 sites in the UK exceeded the limit for PM10s. The pollution has been exacerbated by the number of people driving. An estimated 18 million vehicles will travel over this weekend and next. Time to remember once again the naïve enthusiasm with which the last CEO of the London Cycling Campaign welcomed the prospect of a cycling prime minister and a cycling mayor. And don’t forget the car dependency and the obesity. Forget Africa and the Middle East. K Chapman reports ‘four days of fear and harassment’ in Scarborough. It’s the safest cycling in England! York is, by our calculation, the safest place in England to cycle. Yes, indeed. This is the cycle lane on Bootham (A19), the main route into York city centre from the west. Cycling doesn’t get much safer or more attractive than this, does it? In fact York is so safe and attractive for cycling that modal share has gone from 18 per cent in the 1990s to an amazing 12 per cent today. Not bad for a city with a student population that has risen sharply over the past 15 years. So please ignore the carping of peevish bloggers. Cyclists must stay to the right of the continuous white line. This beautifully designed, well lit, and well and maintained cycle path can be found in York, Britain’s second cycling nirvana after Cambridge. It has been specially created for those cyclists too afraid to use the roundabout at the north end of Monkgate. (Below) As you rejoin the road please take care not to collide with the litter bin, approaching traffic, or pedestrians who cross at this point. (Below) As you can see, Monkgate itself is far too narrow for segregated cycle paths on the Dutch model. It just couldn't be done. So there's no point in demanding the impossible. (Above) A typical cycling-friendly London junction, where two ‘A’ roads meet. HGV's are not on urban roads for fun, or because they simply want to be, they are there for a reason, to deliver goods, Cyclists on the other hand have alternatives, called trains buses and taxis, your average lorry driver cant carry his 23 tonnes of goods onto a 24A bus to avoid travelling down a certain street, cyclists have that choice. (Below) Rikki’s right. Note the bus stop on the right of this picture, showing how much more sensible it would be to abandon cycling here and transfer to a bus. As for the alternative of taxis. That’s not a problem for any cyclist in central London. The 30-year-old athlete dons tiny leotards and knee-high socks as she shows off her incredibly toned figure while pulling off some incredibly alluring poses on a bicycle in the new pictures. I am not sure that 'pulling off' is quite the right expression, suitable though it might be for Daily Mail readers. The cyclists most at risk of a collision are arguably those who are most exposed to risk. This might mean cyclists who take foolish risks. Gareth, for example, notes that I witness on a near daily basis cyclists filtering in the blue cycle lane in an unsafe position. But careful, experienced non-risk taking cyclists also get knocked down, and those who are most at risk seem to be those who do a lot of cycling, especially on ‘A’ roads outside urban areas. Two examples spring to mind. Firstly there are people on charity cycle rides. They may be relative novices when it comes to cycling but when they end up being knocked down it is not necessarily as a consequence of anything they’ve done. It is simply that very few people cycle on non-urban ‘A’ roads any more. Those who do are often club cyclists, time trial cyclists, or dogged CTC ‘right to ride’ cyclists. Their willingness to ride on fast roads where few other cyclists venture exposes them to danger from drivers who aren’t expecting to meet a cyclist. Like last Wednesday morning, when two cyclists were killed by drivers who were subsequently arrested by police. A motorist has been arrested following the death of a cyclist in a road crash on the A55 on Anglesey. The rider, aged in his late 20s and not from north Wales, was with a group of five cyclists who were thought to be on a sponsored bike ride. The incident, involving a silver Vauxhall Corsa car, happened between Gwalchmai and Llangefni at 1017 BST on Wednesday. There’s more information about the victim here. Interestingly, two vehicles crashed on the same road the day before. Police say the 43-year-old woman, who died in hospital, was from Jesmond in Newcastle. She was cycling along the A189 Spine Road, near Cramlington, when the crash happened on Wednesday morning. A 22-year-old man has been arrested and bailed on suspicion of causing death by careless driving. was an avid cyclist whose love of bikes took her all over the world, but she was killed on her commute to work when she was involved in an early morning collision with a van on the A189 Spine Road, near Cramlington, on Wednesday. “Amongst the many activities she enjoyed she was a keen long-distance cyclist having cycled in the Pyrenees, Caribbean and Western Isles. I do the A19/Spine Road commute most days and the traffic doesn"t often travel under 80. There needs to be a proper cycle path built, there have been more than enough deaths on these roads and its a popular route. A CYCLIST is recovering from head injuries he suffered in a road traffic collision when the bicycle he was riding came into contact with a car in Bengeworth. Police were called to the scene and arrested a man in his 30s on suspicion of dangerous driving. The collision between the bicycle and the grey Saab car happened at the bottom of Badsey Lane near where it joins Elm Road. Being a good carbon citizen isn't just about looking good on paper gushes the SERCO website. This morning I saw one of your drivers steering with one hand while talking on a handheld mobile phone. The registration number was BN08 EAG and this white van said on the side SERCO INCIDENT SUPPORT. The driver appeared to be a white male. He was evidently right-handed, as he was holding the phone to his right ear and steering with his left hand. He was driving west on the A503 (Forest Road, London E17) and I saw him at 10.20 am. Perhaps you could enlighten me as to what standards SERCO expects of its drivers, particularly with regard to using handheld mobile phones. Thank you for your e-mail which I shall forward to our Fleet Department for initial investigation and response. Is your neighbourhood infested with cyclists? Do you feel the time has come for some firm action? This life-size trap allows you to catch one fully-grown cyclist. Simply place beside a bike stand and watch it fall over and trap the cyclist. The cyclist may then be humanely disposed of by being released on to a fast dual carriageway filled with speeding BMW and Audi drivers, 93-year-old drivers with poor vision and a history of heart trouble, and lorry drivers chatting on mobile phones. A DRIVER who knocked a cyclist over while on her mobile phone has been spared jail. Samantha Malik, 44, of Crink Lane, Southwell, appeared at Nottingham Crown Court last week and admitted crashing into the cyclist after using her mobile phone while driving. She pleaded guilty to dangerous driving. The cyclist, who is in his 80s, sustained serious injuries and spent three weeks in hospital after he was struck by Malik's Land Rover in the Ropewalk, Southwell, on June 21 last year. Malik was given a nine-month jail term, suspended for 18 months, and has been banned from driving for 18 months. Sgt Brendon Hunt, based at Southwell police station, said: "The dangers of using a mobile phone while behind the wheel of a vehicle is evident in this case. "The cyclist was extremely lucky to survive and has not had the courage to get back on his bike since the collision. The lorry turned left at this junction. Her name was Paula Jurek. A FRIEND of a student from London Met who was crushed to death by a lorry has written to Boris Johnson to urge him to take action to prevent more tragedies involving cyclists in London. ‘If’? At a junction which has no crossing lights for pedestrians and no Advanced Stop Lines on Camden Road? Camden Road is a four-lane carriageway entirely devoted to the supremacy of car drivers and other motorized transport. 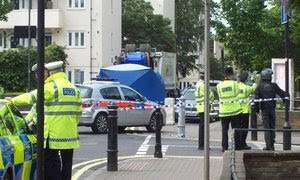 Police said the lorry was turning left into St Pancras Way when it collided with the cyclist, who was on its nearside. "Even a casual visit to the spot where Paula died makes it abundantly clear that the intersection could be safer. I would ask that, if nothing else, you immediately exercise the powers of your office to address these specific issues before any similar incidents are allowed to occur." Mr Dean’s fears are echoed by other cyclists who regularly use the busy four-way yellow box junction close to Camden Road station. 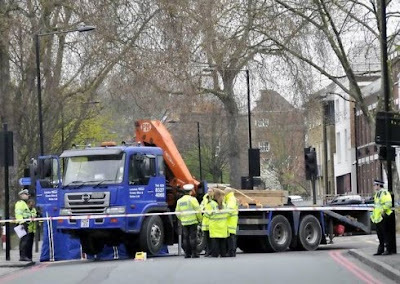 Maria da Assuncao Grijo, 73, a Streatham resident originally from Portugal, was waiting to cross the road when an MTS sewage truck turned from Streatham Vale in to Woodgate Drive, at 9.35am on Friday (April 8), trapping her underneath the back wheels, witnesses have said. The driver of the lorry - a 55-year-old man - was arrested on suspicion of causing death by dangerous driving. 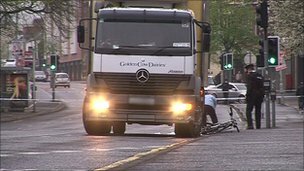 And this morning in Belfast a cyclist was killed by a lorry. "We felt an obligation to go out and remove that obstacle," said department spokesman Rick Feller. "At worst, it can be an object that, if there's an accident at that intersection, can present another item that flies through a window or somehow otherwise injures people," Feller said, citing the laws against placing things in public rights of way. (Below) An undercover policeman cleverly blends in with invisible cyclists during an outbreak of cycling anarchy. And all this Waltham Forest Council advertising campaign cost was eighteen thousand pounds! Keisha Wall, 20, a university student, was sitting alongside her mother, who was a driving instructor, when she lost control of the Suzuki Jimny she was driving and hit Christine Lyon, 63. 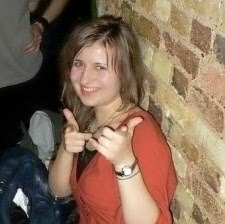 Wall had passed her driving test only months previously and was looking at the message on her mobile phone when she mounted a pavement and struck Mrs Lyon, who was crushed against a wall and died instantly. Wall got her mini 4X4 as a present. She’s an unrepentant narcissist who turned up at court clutching her mobile phone. Her driving instructor mother was complicit in her reckless driving but has not apparently been prosecuted for anything, nor does her career as a driving instructor seem to have been jeopardised in any way. Judge Stephen John said that the crash came under the lesser category of 'avoidable distraction' under level three for the sentencing guidelines. This murderous egotist was therefore only banned from driving for three years. Copenhagen Street offers all the thrills of vehicular cycling in London, i.e. vehicles being driven very close and bits of crap cycling infrastructure combined with street features designed to suppress cycling among normal people. Sadly there were no cyclists around for my photographs. The great London ‘cycling revolution’ must have been taking place somewhere else that day. Copenhagen Street has that classic feature of British cycling infrastructure – a bike logo just before some parking bays which force cyclists out into the path of overtaking motor vehicles. Sadly a segregated cycle path is not possible here because as a top person in the Islington LCC branch has said, the streets are just too narrow. Copenhagen Street has advisory cycle lanes, narrow enough to provide the visceral thrill of someone racing past you very close. Copenhagen Street also has those wonderful cycle lanes that don’t work at weekends. Because obviously nobody in London cycles on Saturdays and Sundays. And it’s important to be able to have car parking on both sides of the street. Which is obviously too narrow for segregated cycle paths. The Mayor of Copenhagen got rid of on-street car parking but that's foreigners for you. The Mayor of London doesn't believe in that sort of thing. Lastly, Copenhagen Street has a number of stress-inducing pinch points. And once again you can see how it's far too narrow for segregated cycle paths. All you require is strong nerves. cycling crime hotspot – can you help? It’s the right to ride! It’s the cradle of the ‘cleaner streets’ policy!